In an industry where American jobs are down 85% since 1995, the All American Clothing Co. continues to grow and combat the norms of taking efforts overseas. As unemployment rates continue to exceed their highest numbers since the Great Depression, the All American Clothing Co. strives to make a difference in those numbers by creating many American jobs with every U.S. Made clothing item they carry and sell. A recent report by the U.S. Bureau of Labor Statistics showed that in 1995 the number of U.S. jobs in the Apparel industry exceeded over 800,000 employees. Today that number has dramatically dropped as the number of jobs hardly exceeds over 100,000 jobs. This comes as a result of companies taking their efforts overseas in order to make more profits, ultimately causing many Americans to lose their jobs. As unemployment rates continue to exceed their highest numbers since the Great Depression, the All American Clothing Co. strives to make a difference in those numbers by creating many American jobs with every U.S. Made clothing item they carry and sell. The All American Clothing Co. was started in 2002 at a time where many ‘American Made’ businesses had already started to take their efforts across the borders. The company was built with a passion to combat this. The American Made clothing company takes pride in doing the right thing as they have passed up multiple chances to take their efforts across borders. Instead of causing many American families their jobs, the USA Made clothing company continues to do what is right. Co-owner BJ Nickol says, “It pays more to do the right thing and make a difference in this country then it does to save a penny as an individual.” Amidst their passion and effort, All American has grown 65% and 70% in sales over the past two years. It turns out that doing the right thing really pays off. The company has added over 20 new American jobs in their cut & sew facility and is in a planning stage to build a new corporate building—which will also develop up to 10 new American jobs. 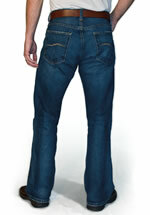 The All American Clothing Company is a successful ‘American Made’ business in today`s economy. The entire company supports a “USA Made passion” as they strive to foster loyalty among customers. Their ‘Traceability’ program allows consumers to track their jeans through the production process from the farmer who grew the cotton to the finished product—giving proof that their jean was Made in USA. The All American Clothing Company can be found on twitter, facebook, and their company website. To find out more about the passion and effort it takes to build a business in today`s economy go to http://www.allamericanclothing.com and read “Our Story.” 888-937-8009.